Well as far as birthdays go, this year’s was a week long celebration and probably the most epic to date. Not since my mum bought me Daws Moranna (my hugely successful show horse) for my 18th birthday have I had so much excitement to mark the anniversary of my birth. It all started last September when a dear friend of mine, James Wheeler, contacted me to say he had recommended me to model for a photography day in Duxford for Darren Harbar. The style would be vintage and he thought it would be right up my street. I’m going to blog separately about this experience as I feel some of you reading this may be interested in the course as it covered a wide variety of skills and techniques that budding and experienced photographers alike could benefit from. Anyway, why I mention this here is because the photography day would put me in Duxford for my birthday, which leads nicely on to the next thing to happen in February 2018…. It was the middle of the night and I wasn’t sleeping well. The sleep demons were starving me of any rest and I had a millions plans and thoughts whizzing through my brain. I had just started raising money for my half marathon and wing walk adventure when my phone pinged. The person messaging wasn’t being anti social by messaging in the night for they were in a different time zone across the Atlantic in America. It was my friend, Mark Streit. He had seen my post on Instagram about my charity page and as he also had personal experience with a loved one having had Lymphoma, he was messaging to say he had made a lovely donation to the account. With my insomnia at its peak, I took the opportunity to chat with Mark for some time: about life, about illness, about aircraft. Mark happened to mentioned he had visited the UK and had been to Duxford where he had photographed a “Texan” called the Wacky Wabbit… yes we did the potato/potato joke when I reminded Mark we call it the Harvard over here. Mark shared his picture from his visit to Duxford onto my Facebook wall where I tagged in Andrew Goodall, the pilot of the Wacky Wabbit. Conversations continued resulting in Andrew offering me a flight the same weekend as the modelling gig and of course, my birthday! When I arrived at the airfield, the team were busy cleaning the Wabbit, polishing her to a glowing sheen. Well when I say the team, I mean Donny, Tim and Sue as Andy was busy filming it all for his first live feed! Donny, Tim and Sue look after the old girl when Andy is out of the country, making sure she is well cared for and maintained. They do this all voluntarily and with journeys of up to an hour from home, this is a real labour of love for them. When speaking to them, their passion for the aircraft and aviation in general is evident. Tim,in particular, has wonderful knowledge of all the aircraft at Duxford and those at Shuttleworth and Sue has previous experience with working with other aircraft such as the Shackleton. Andy is an enigmatic soul who’s passion for the history of the aircraft feeds his desire to have things just so, even down to having kit as close to that used back in the day. He has a military background linked to freefall display teams and his ambition to one day fly the iconic Spitfire drives his motivation to continue furthering his experiences as a pilot. The banter between the team was rife and they immediately made me feel at home. It was great to get to have close access to the aircraft to take images you just don’t get at airshows, even when on static display. Andrew and the team form part of a large group of people who commit time to the Harvard and admin many groups dedicated to the aircraft and her history. On this day, Andrew had friends arriving from Portugal. The father of the family was a former Portuguese Air Force pilot and had flown Harvards in operation. He told some wonderful stories about his time in service and I hope to write a follow up article dedicated to his experiences in coming months. His sons and he enjoyed a flight in the Wacky Wabbit and it gave me a nice chance to capture some shots with her in flight. With all this activity going on, I didn’t even have time to think about my own forthcoming flight and it struck me as I laid my camera down for the last time that I wasn’t feeling any nerves.. it was most odd. Perhaps the banter from Donny was keeping them at bay! Tim helped me climb up in to the Wabbit and helped me strap in.. still no nerves. He fitted my headset and ran through comms… still no nerves and then it dawned me. I was comforted by the solid sturdiness of the Harvard. It was like a trojan horse, certainly feeling like it had a leg in each corner. Andrew was brilliant, knowing I was new to small aircraft flying and a definite beginner to aerobatics, he eased the Wabbit into the air and talked me through everything that was happening. As we soared above the lush greenery of Duxford, still the fear had not taken a grip; in fact I was smiling, grinning like a Cheshire Cat. It was like no feeling ever, a sense of freedom as we glided into the clouds. Nigel Wood once told me that the day I flew in a small aircraft would be the day I’d appreciate the love for flying and as always, Mr Wood was right. It was incredible, looking down and seeing the world from a different view. I mentioned my horse earlier for good reason. I have two; Moranna, who is a stocky riding horse and Crystal, who is more petite riding hack. I expected the flight in the Harvard to be like riding Crystal, perched on top of something quite fragile and feeling like there was nothing but air around me. However it wasn’t. A flight in the Harvard was like riding Moranna, safe, all encompassing and absolutely unshakeable. The strong body of the aircraft never once felt frail or rattly. This for me was the most unexpected observation I made whilst in the air. Before I knew it, the clouds began to creep in and we headed back to Duxford with a sweeping hangar pass. The deceleration for landing was a little strange to experience. Cruising at approximately 90mph felt very slow by comparison and Andrew gently placed the Wabbit back on the grass runway. My first flight was over and I was so pleased I had experienced it. I can no longer claim to be scared of flying! The day was far from over though. Next up I got to meet someone who I have known for sometime on social media and who is always so supportive of everyone’s adventures; Ms Claire Bassett. Claire had won a competition on Instagram to fly in the Harvard and for her it was an experience that would have a much deeper connection. 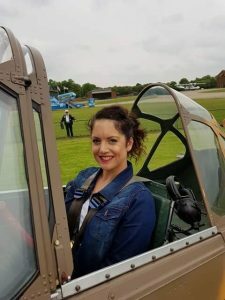 Claire had wanted to fly in a Harvard since being a small girl when she used to run to the bottom of her garden with her Grandfather as the Harvards flew overhead. He would tell her about their engines from the noise they made and they would engage fo hours in conversation about these beauties of the sky. These precious memories gave birth to Claire’s love for aviation and today really would be a dream come true for her. A bigger smile could not have spread across her face and the competition win really could not have happened to a lovelier lady. Soon it was time to put the old girl to bed in her hangar. She boosts bed companions such as the Catalina, the Spitfire and the awe inspiring Thunderbolt. The Wabbit operates for pleasure flights from various locations around the country. If you think it is massively unaffordable to experience her charm, you may be surprised to know a 20 minute flight costs from £399. I’d like to thank Andrew, Tim, Donny and Sue for hosting me for the day and making the end of my 36th year a memorable one. Until Next Time, Smile for the Camera!